We left Broome with the intention of making it to Cape Keraudren for a couple of nights but our late start to the day’s drive meant that we wouldn’t get there until nearly 6 and be setting up in the dark. We opted to stop at 80 Mile Beach instead and ended up at the Sandfire Roadhouse for a leftover unpowered site (there seemed to be plenty of room unpowered). Miss6 (aka Dr Dolittle) was in animal heaven when we set up as she soon realised that not only was it a pet-friendly stop but the roadhouse had a huge bull and camel in the paddock behind our van, plus an impressive collection of colourful peacocks roaming the roadhouse. 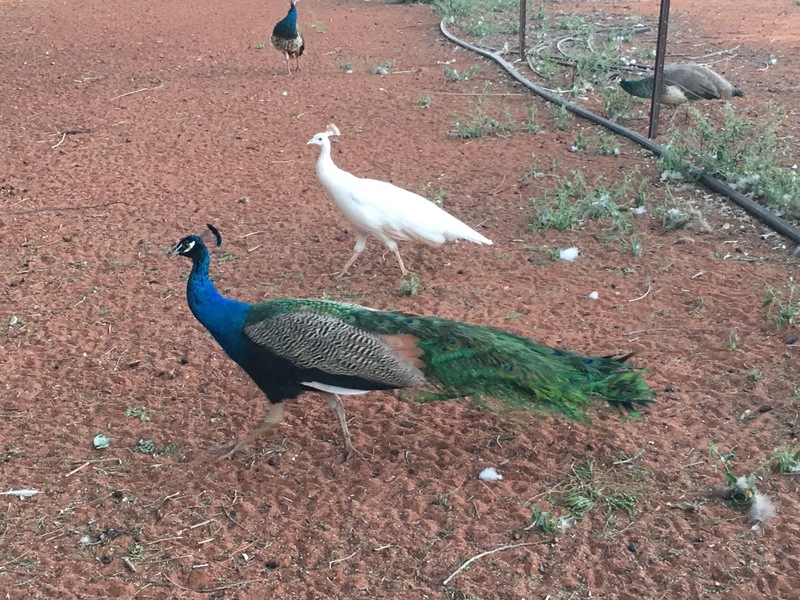 There were even around eight white male and female peacocks plus a heap of chooks and ducks for her to follow around and watch. We made use of the camp kitchen and BBQ and whipped up some dinner ready for a drive the next morning to stay along the coast. 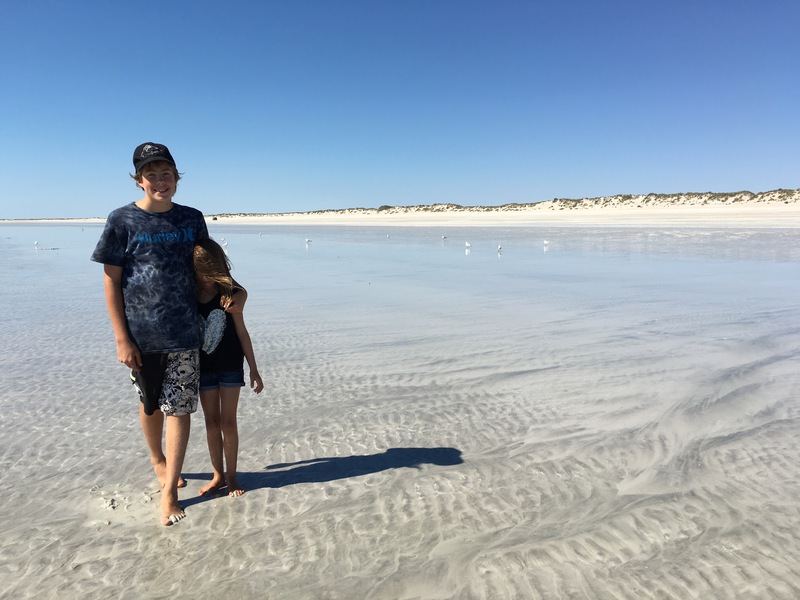 We ended up skipping Cape Keraudren and staying at the 80 Mile Beach caravan park which Miss6′ number one customer had told us about. The sites here were close to the beach but still lush and grassy and huge so we were pretty happy. We took a walk along the beach after setting up (it was only a 45 minute drive from the roadhouse so we got there early enough to spend the entire day there). 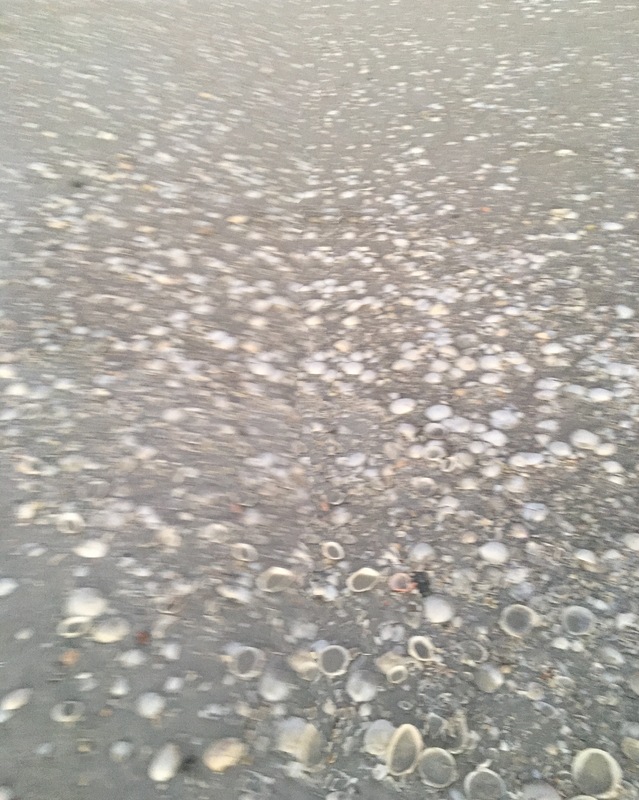 We’d been told there were shells everywhere on the beach and they weren’t wrong – there were literally thousands of them and they were piled up for miles (80 of them in fact). I think I too was in shell heaven with Miss6 as we collected up a heap of them in different shapes, sizes and colours – always looking for that illusive large cone shaped shell. As we’d walked to the beach we had bumped into our friends from Flinders Ranges NP – they had also arrived today and were off exploring the beach. 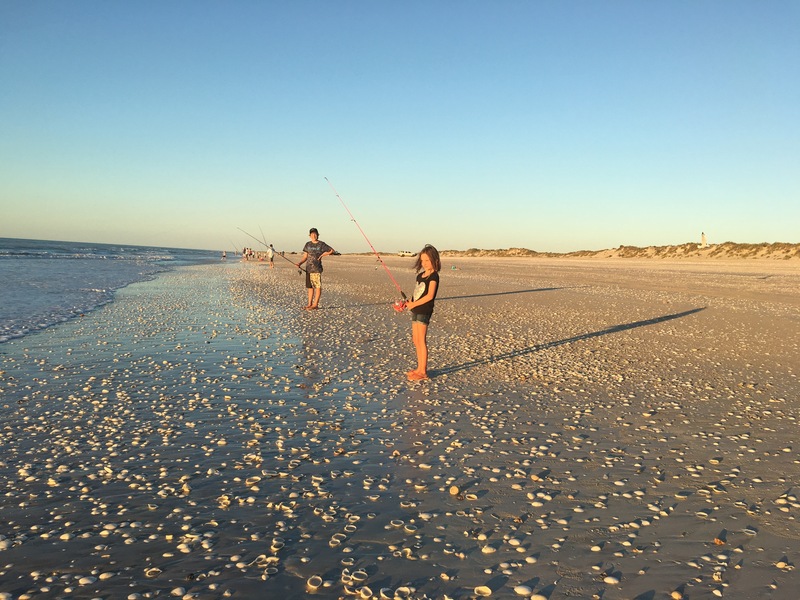 The kids spent some of the afternoon washing the shells they’d collected and comparing them to the lovely older lady camped next to us – she was another grey nomad that showed genuine pride and happiness in me and what I was doing touring around with the kids. In the late afternoon, we all channeled Alf Stewart in the hopes of catching a fish off the shore (I was hoping for a nice sized salmon). 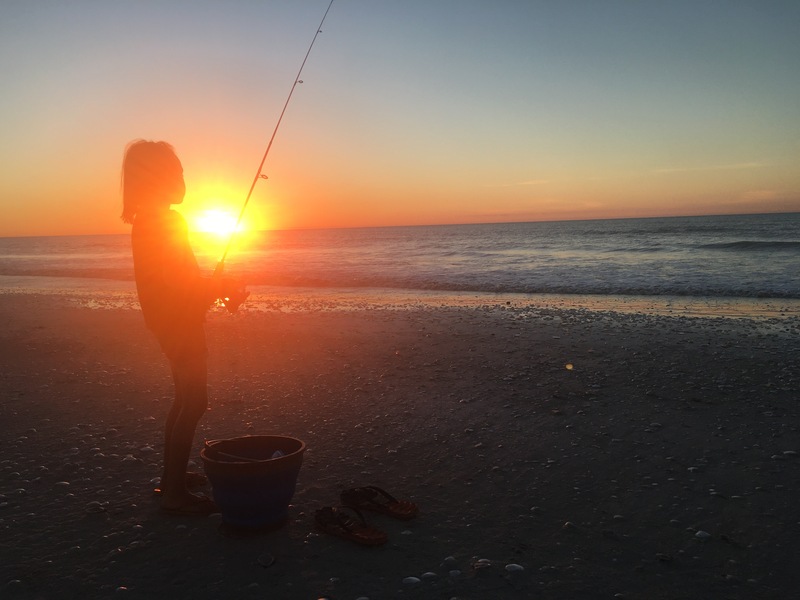 The last few days had been pretty windy along the coast though so the fish weren’t really biting but it was a lovely way to spend the afternoon and watch the sunset over the beach. 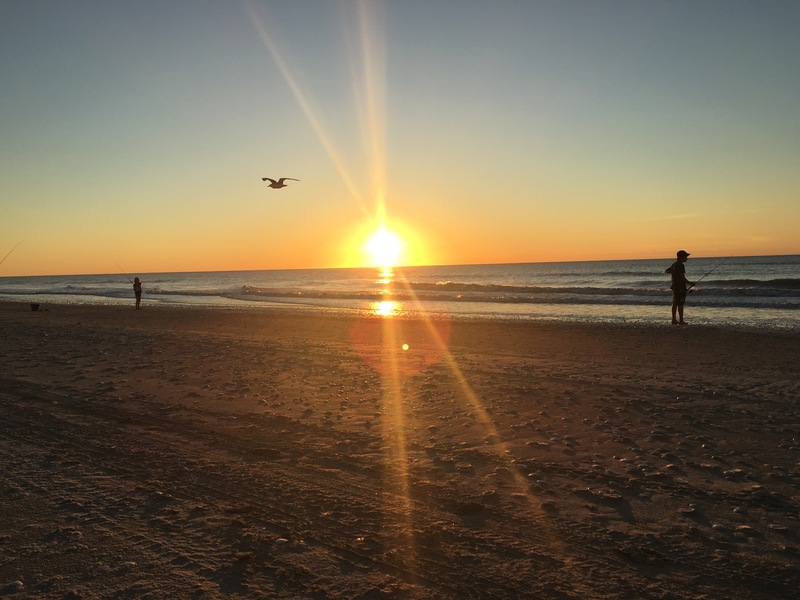 The next morning we decided to unhitch the car and drive it along the beach – our grey nomad neighbour with an enthusiasm for shell collecting, had told us that some of the best shells were about 10km down the beach. We started the drive along the sand and I soon realised that the beach here wasn’t like Cable Beach at Broome but much softer and slippery so I took it easy and at our first pitstop I let some air out of the tyres just to be sure. We continued driving further down the beach stopping regularly to look for shells and only moving further along when we knew there was another car further along than us (I figured if we got stuck they could help as I didn’t want to lose the car to the tide as I know others had done before). By the end of our stay at 80 Mile Beach we had half a Corona slab box of shells, driftwood, coral pieces and even some sort of rib bone (Master14 was hoping it was from a large fish but I’m sure it’s cattle) and intentions of some serious craft time when we get back to Melbourne. Miss6 even has visions for which of her creations she could sell at her future art markets.